Bindelle, J., Ilunga, Y., Delacollette, M., Muland Kayij, M., Umba di M’Balu, J., Kindele, E. and Buldgen, A. Voluntary intake, chemical composition and in vitro digestibility of fresh forages fed to Guinea pigs in periurban rearing systems of Kinshasa (Democratic Republic of Congo). 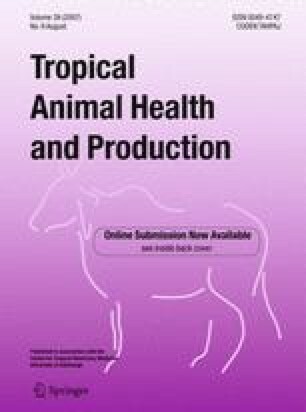 Tropical Animal Health and Production. The daily voluntary intake (DVI) of Guinea pigs (GP) fed 15 fresh forages used in periurban rearing systems of Kinshasa (Democratic Republic of Congo) was investigated. In order to determine the best forages combination for GP diet, DVI was compared to their nutritional value measured in vitro using 1) a pepsin-pancreatin hydrolysis, 2) an gas fermentation test on the hydrolysed residues with an inoculum prepared from GP faeces, and 3) the chemical composition of the offered feeds and the hydrolysis residues. The forages ranking based on the DVI was correlated to the NDF content, but not to their nutritional values determined in vitro. According to their high DVI (from 4.23 to 7.75 g/kg liveweigth), and their valuable in vitro nutritional values (crude protein ranging from 261 to 279 g crude protein kg−1DM, pepsin-pancreatin digestibilities of the dry matter from 0.55 to 0.59 and final gas production from 170 to 196 l kg−1DM), Desmodium intortum, Euphorbia heterophylla or Amaranthus hybridus, can be suggested to the farmers to complement the usual diet distributed to the GP based on Panicum maximum. Fonteh, F.A., Niba, A.T., Kudi, A.C., Tchoumboue, J. and Awah-Ndukum, J., 2005. Influence of weaning age on the growth performance and survival of weaned Guinea pigs, Livestock Research for Rural Development. 17. http://www.cipav.org.co/lrrd/lrrd17/12/font17133.htm.